It’s a little over one hundred years since Charlesworth & Co. registered P. Maudiae (1900). 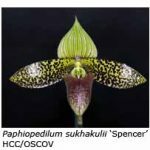 Albinistic (albino) forms of P. callosum and P. lawrencianum were used to create this wonderful green-and-white flowered paphiopedilum hybrid, arguably one of the most popular ever produced. Together with P. Harrisianum (the first paphiopedilum hybrid, 1869) and P. Leeanum (1894), P. Maudiae has had a profound influence on paphiopedilum culture and hybridisation. P. Maudiae has proven to be a most successful crossing in terms of both impact and longevity. The first crossing between P. callosum var. Sanderae and P. lawrencianum var. Hyeanum produced albinistic offspring bearing large glossy flowers with white dorsal sepals veined with green, light green-veined petals and a green labellum. These seedlings were a sensation at the time and many of these plants are still grown today. A well-grown plant of P. Maudiae ‘Magnificum’, which received its FCC/RHS in 1901, is still capable of success on the show bench. 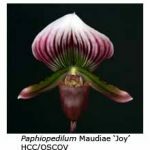 The P. Maudiae cross was so popular and had such a significant impact on our hobby that most orchid societies introduced a class for P. Maudiae in their show schedules. The successful use of albino parents in the first P. Maudiae cross was probably not entirely fortuitous, for P. Gowerianum (P. curtisii x P. lawrencianum, 1893) and P. Goultenianum (P. callosum x P. curtisii, 1894) were already known. However, its startling success opened the way for other hybridists to use different parents. The crossing of an albino P. callosum and a normal coloured form of P. lawrencianum to produce P. Amy Leeman (1906) created an interesting dilemma for the RHS in ratifying the chosen name. The RHS decision that both albino and coloured hybrids between the same two species would bear the same name applies equally today. Accordingly, P. Amy Leeman was renamed P. Maudiae var. Amy Leeman, the first in a long line of the so-called P. Maudiae ‘coloratum types’ using normal-coloured forms of the two parent species. Many other crossings were soon created, using both albinistic and coloured forms of P. Maudiae as parents. Some wonderful albinistic types appeared. P. Alma Gavaert (P. Maudiae x P. lawrencianum) was registered in 1911 while the beautiful green P. Emerald (P. curtisii var. Sanderae x P. Maudiae) appeared in 1920. P. Clare de Lune (P. Maudiae x P. Emerald), registered in 1927, had much larger and more impressive flowers. This crossing has since been remade, the cultivar P. Clare de Lune ‘Edgard van Belle’ being a further improvement. Some of the early P. Maudiae ‘coloratum’ types included P. Holdenii (P. Maudiae x P. callosum, 1909), P. Sunset (P. Maudiae x P. barbatum) and P. Ernest Read (P. callosum x P. William Matthews), the latter parent being a hybrid between P. lawrenceanum and P. mastersianum. It was not until the 1960s that two discoveries stimulated further development in P. Maudiae-type hybrids. 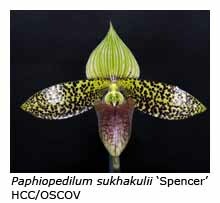 The first was the 1964 discovery of P. sukhakulii, a Thai species with a large flower and spotted petals. This new species was soon crossed with P. Maudiae to give P. Makuli, a well-shaped hybrid with petals held more horizontally than those of the normal P. Maudiae. A later discovery of an apparently albinistic form of P. sukhakulii (forma ‘Aureum’) led to crossings with the green- and white-flowered forms of P. Maudiae. While attractive, paler-coloured forms of P. Makuli were produced, they were not true albinos. The first truly new hybrid using the new P. callosum was P. Vintner’s Treasure, registered in 1982. This resulted from a crossing of P. callosum ‘Merlot’ (a dark burgundy-red flowered paphiopedilum derived from a ‘selfing’ of P. callosum ‘Sparkling Burgundy’) with P. Kowloon. The best offspring of this crossing produced elegant, purple-red flowers, generally well displayed on tall stems. These plants had huge appeal and many will remember the scramble to obtain a seedling plant and the inflated price paid for those seedlings. Some successful crosses derived from P. Vintner’s Treasure include P. Voodoo Magic (P. Vintner’s Treasure x P. Goultenianum), P. Jo Anne’s Wine (P. Vintner’s Treasure x P. Maudiae) and P. Dragon Ruby (P. Vintner’s Treasure x P. Singapore). In the last 20 years this line of breeding has progressed and the results are outstanding. 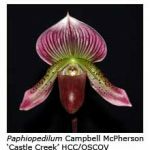 The inclusion of other paphiopedilum species in the breeding programs has added size, colour and variety to the P. Maudiae group, yet retained its appeal. It also raises the question of what now should constitute a ‘Maudiae-type’ for judging purposes? I would like to see the compatible hybrid forms mentioned above included, rather than assigning these marginally different newcomers to the inappropriate ‘Novelty’ class. 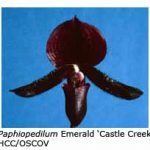 Those looking for these new seedlings will find our larger shows, orchid fairs and retailers, including mail and Internet orders, the best sources. Some of the crosses include P. Chateau Margaux (P. Macabre x P. Raisin Jack), P. Campbell McPherson (P. Purple Velvet x P. Raven’s Flight), P. Raisin Candy (P. Raisin Pie x P. Raisin Jack), P. Mod Maude (P. Maudiae x P. Red Maude) and P. Hampshire Red Star (P. Starr Beam x P. Red Maude). Of the lovely green and white Maudiae types, a well grown plant of P. Gael ‘Camira’ still does well on the show-bench as does P. Maudiae ‘The Queen’. Others include P. Kanunda (P. Gael x P. Meon), P. Silver Bell (P. Silver Fleuret x P. Alice Bell), P. Bendigo Silver (P. Silver Fleuret x P. Goultenianum) and P. Jill Mathers (P. Silver Fleuret x P. Sara Gillis).